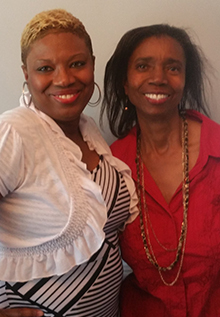 Emory professor Lynne Huffer (right) and her life partner, Tamara Jones, utilized Emory's caregiver consultation benefit when Jones' mother began showing signs of memory loss. Courtesy photo. Emory’s WorkLife Resource Center offers support to help employees charged with caring for aging parents, spouses or adult loved ones. In addition to Care Consultation, the most recent enhancement to the Emory Caregiver Support Program, the program also offers various support services and resources to help employees managing the care of an adult loved one. Professional Care Management: Provided by LifeCare, this benefit provides up to six hours a year, Nov. 1- Oct. 31, of geriatric care consultation with a professional care manager at no cost, which may be applied towards in-home or post-hospitalization assessments, facility reviews and ongoing care coordination. Information and Referrals: BrownRichards and Associates, an E4 Healthcare company, provides Emory caregivers an opportunity to speak with an adult care specialist by phone to help prioritize needs, lend education and insight into care options and providers, and explore care options, including availability checks and fees. Dementia and Alzheimer’s disease resources: Information, education and resources are available to help employees responsible for the care of a loved one living with dementia and Alzheimer’s disease. Dependent Care Information for Managers: The Emory WorkLife Resource Center has compiled information and resources to help managers support their staff who are caring for adult loved ones. Emory Faculty Staff Assistance Program: Comprehensive programs that focus on caregiver wellness offering counseling, grief and loss support, physical and nutritional health. CareGiver Workshop Series: Employees and their families can learn about issues around geriatric caregiving through free workshops offered throughout the academic year. The next program will be “End of Life Discussions with Someone You Love” on July 16, from noon to 1:30 p.m. in the Nell Hodgson School of Nursing, room 201. Learn more about upcoming workshops. When Tundra Ivy began caring for her elderly grandmother a few years ago, she found herself immersed in a whirlwind of doctors and diagnoses, prescriptions and long-term care — a world she knew little about. “I’d never been in that position before and had no guidance,” recalls Ivy, an administrative assistant in the Office of Research Administration. “At the end of the day, I found that you don’t really know what you don’t know about being a caregiver until you are in that situation,” she adds. Although her grandmother was in fairly good health, Ivy wanted to make the best choices concerning her care without impacting her job at Emory — a balancing act now being felt by a growing number of American workers. Through emails, Ivy learned about free workshops offered through Emory’s WorkLife Resource Center (EWLRC) and the Faculty Staff Assistance Program (FSAP) to support Emory employees facing adult caregiving responsibilities. From sessions on insurance, care options and legal issues to nutrition and self-care, Ivy found both good information and support. “You’re with people who are exactly like you, at some point on the broad spectrum of being a caregiver,” she says. So when Ivy took on the new role of caring for both her mother and her former mother-in-law last year, she knew where to turn. And her timing couldn’t have been better. To help Emory employees best utilize the Emory Caregiver Support Program, the EWLRC has launched Emory Care Consultation, a new option that provides one-on-one assistance for employees navigating the caregiving journey. The service is a starting place, a gateway to learn how to access Emory benefits and public resources, along with receiving private, personalized support, says Mary Ellen Nessmith, a work-life specialist who provides care consultations. Through the consultations, employees will find guidance, referrals and a sounding board, Nessmith explains. “We may talk about how to get into a Medicare-waiver program or get in touch with the VA or how to access our professional care management program. While Emory has long provided information and support for caregivers, individual care consultation is a new component, offering free one-on-one appointments — in person or by phone — to discuss a range of options and resources available through the Emory Caregiver Support programs, Nessmith says. “If someone has no idea what the next step is, we can help them take those first steps to navigate through Emory’s caregiving benefits, preparing to become a family caregiver, exploring your own eventual care, or assisting with problem solving and planning,” she says. For many Americans, stepping into the role of caregiver is a new reality. But finding the best information or answers can prove both frustrating and overwhelming, Nessmith says. A 2010 dependent care needs assessment conducted at Emory found that 15 percent of respondents had taken on some adult/elder care responsibilities, exceeding the national average of 12 percent. Notably, nearly 60 percent of respondents expressed concerned about effectively balancing work and the responsibility of caring for an older, disabled or chronically ill family member within the next three years. Clearly, the need is there, Nessmith says. Since joining Emory in January, she has worked with nearly 60 employees. And the response has been positive. “It’s great to see employees' stress levels decrease and be able to utilize the resources that are out there to help,” she says. Tundra Ivy (left), an employee in the Office of Research Administration, serves as caregiver for her mother (right). She first sought help from the Emory Caregiver Support Program when caring for her grandmother. Courtesy photo. A joint research study conducted by the National Alliance for Caregiving and the AARP released this month shows that caring for aging Americans is a growing concern. About 34.2 million Americans have provided unpaid care to an adult age 50 or older in the past 12 months, with nearly half of caregivers assisting a parent or parent-in-law. Those caregivers spent on average 24.4 hours a week communicating with health professionals, advocating for recipients, and providing daily personal care. Half of the caregivers felt they had no choice but to help, the study showed, even at the cost of emotional stress and financial strain. Six in 10 caregivers reported being employed at some point in the past year — among them, 56 percent worked full time. Over half of employed caregivers reported having to make a workplace accommodation as a result of caregiving, including cutting back on work hours, taking a leave of absence or quitting a job. Rather than have employees leave, companies are increasingly being asked to accommodate their needs, Nessmith says. Those that do are finding employees grateful for the help. 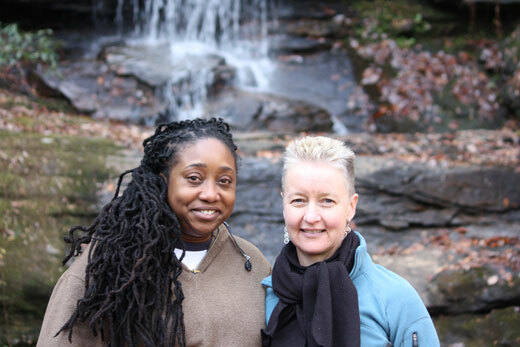 No one knows that better than Lynne Huffer, Samuel Candler Dobbs Professor of Women’s, Gender, and Sexuality Studies, and her life partner, Tamara Jones. When Jones learned that her 76-year-old mother was showing signs of short-term memory loss — forgetting she had things cooking on the stove, for instance — a doctor recommended an immediate in-home assessment and support services, such as meal delivery. Jones launched an online hunt for elder care services in New York City, but searching from Georgia was not easy. “I quickly became overwhelmed with the difference in the levels of services and felt very frustrated, even scared,” recalls Jones, who also holds a demanding, full-time job. It was a faculty colleague who suggested Huffer and Jones reach out to Nessmith for a caregiver consultation, a benefit available to all Emory employees that also extends to their spouses or domestic partners. “With situations of memory loss and not knowing how to manage it or make decisions, you just don’t know what to do,” Huffer recalls. Their first consultation was an hour-long phone call. “Lynne and I got off that call with a very clear strategy that we could implement immediately. We felt like we could breathe again,” Jones recalls. In May, a documentary film entitled “Caring for Mom and Dad,” aired on Georgia Public Broadcasting. Emory employees and WorkLife staff were interviewed for background and guidance on the film’s content. For more information or to schedule a care consultation, contact Mary Ellen Nessmith.